MIME types are a sort of identification card for files on Ubuntu. A file's MIME type is usually determined by the extension of its filename; for example, a text file may end in .txt, and image file might end in .png or .jpg. This tells Ubuntu what icon should be used to represent it and what programs should open it by default. Unfortunately, the obvious options for editing MIME types in Ubuntu are shallow. You can teach Ubuntu to open a certain file extension with a certain program using the Properties window, but you cannot set an icon for that extension as a whole: only for the individual file. This can be annoying if you are say, a Python programmer. Ubuntu does not include a special icon for Python files, and it is hard to visually differentiate .py and .pyc files. This guide will both teach you to add new MIME types and to associate icons with existing types. We will use .py files as an example. 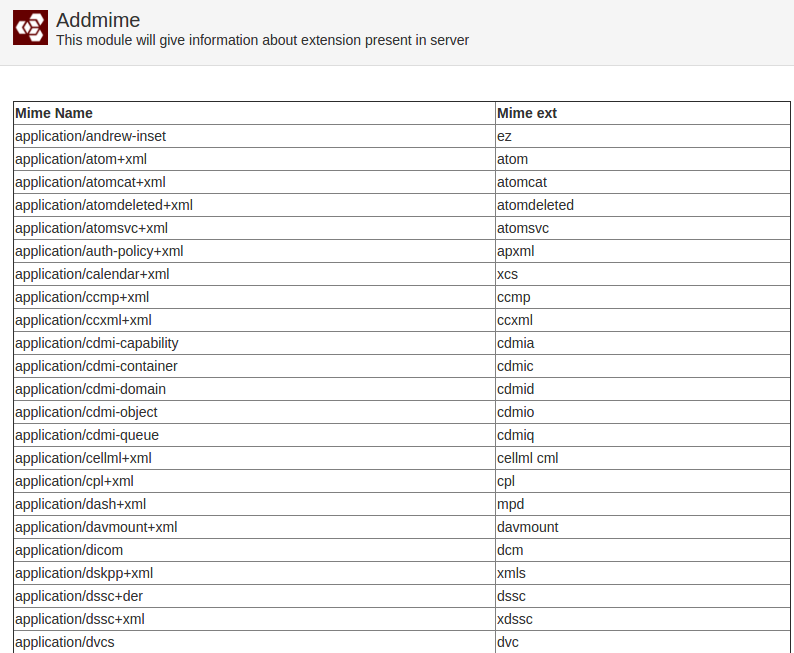 This module shows all the mime types in the cloud or VPS server. Like the above shown table it has n number of extension to display.